FWC has been an OX sponsor since the beginning. Over the years, we have been through a lot of vehicle-based camping setups, beginning with a couple of sleeping bags rolled out on the roof rack of my FJ40. We’ve gone minimalist with backpacking tents and stoves, luxurious with family-sized cabin tents and padded cots. We’ve tried roof tents, trailers, truck-bed mattresses. For some time we owned a WilderNest, a pickup shell with a cunning roof that flipped sideways to turn into a bed, with an enormous tent erected semi-automatically above it. I remember spending a mostly sleepless night trying to brace the frame of that spinnaker-like tent in a 40mph Sea of Cortez Norte. It was never quite the same afterward. Of all the setups that have come and gone, the one about which we wax most nostalgic is our Four Wheel Camper. Mounted first on a 1990 4WD Toyota pickup powered by a willing but overmatched 22RE four-cylinder, then on a 2000 4WD Tacoma with the 3.4-liter six (60 percent more power and better gas mileage), we put over 150,000 miles on that camper, using it as a mobile base for dozens of freelance magazine assignments and several books. At the time, we lived on a wildlife refuge seven miles down a rough dirt road, so even driving to town for groceries gave the rig a workout. Nevertheless, the sum total of my repairs to that camper was a rebuild of the door, which had begun to sag and needed reinforcing. 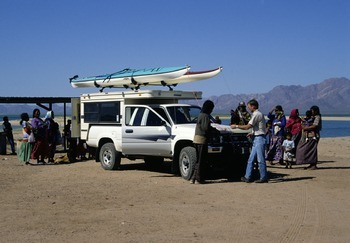 Our FWC in the 1990s, Punta Chueca, Sonora, Mexico, visiting Seri Indian country.We loved the FWC’s 30-second transformation into a full-standing-headroom camper with queen-sized bed, fridge, sink, and stove, and a comfortable settee. Sit-down snack at a rest stop on a highway trip? Easy. A couple of years into ownership, we experienced another Sea of Cortez Norte more furious than the first—and slept like babes. The pop-up roof didn’t even quiver. Despite the comfort and strength, the camper’s relatively feathery, aluminum-framed 700 pounds barely taxed the truck, and never kept us from reaching secluded backcountry hideouts. Gripes? Sure, we had a few. The water tank was too small and mounted too high. The main cabinet doors were flimsy sliding panels of 1/8th-inch plywood. And the three-way fridge gave up even slightly cooling its contents in any ambients over 90ºF. But they were tiny gripes compared to the consummate ease of pulling into a camp spot and having a home ready in less than a minute. 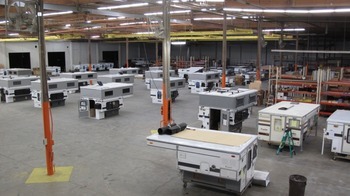 New factory floor in Woodland, CA. Older models belonging to customers, in for modifications or repairs after accidents, are in the lower right.Actually, it’s a different factory, significantly larger than the old one. A good thing, it seemed, because the space was clearly being utilized to the fullest already. 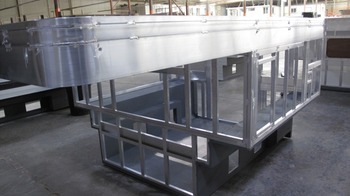 A triple row of campers, aligned as if by laser, stood waiting for successive construction steps, from welding of the bare, elegant aluminum frame to final touches in flooring and lighting. There’s now more room for the ancillary shops such as upholstery and carpentry, which were formerly wedged into corners. Most interestingly, I got an inside look—literally—at the evolution of the Four Wheel Camper under Tom and Celeste’s guidance. The small, high-mounted water tank I mentioned on ours? It’s been nearly doubled in size (now 22 gallons) and moved to the floor under a settee at the front of the camper, perfect for weight distribution. The cabinets now have proper hinged doors. The fridge option now includes a compressor-driven unit guaranteed not to go on strike in summer. And the corners of the main entrance door have been radiused to add significant rigidity. The amazing aluminum frame, a work of art.There was more. The roof—which on ours comprised three sections, yet never leaked despite the fact that I through-drilled it to mount racks for our sea kayaks—is now a one-piece, screw-free aluminum sheet that can’t leak. Much of the interior plywood is now superb multi-laminate European birch; exterior insulation is now rigid foam rather than fiberglass. Appliances have been upgraded, headroom augmented without changing the travel profile, the dining table is now a portable unit that can be used outside—nothing seemed to have escaped scrutiny and improvement. 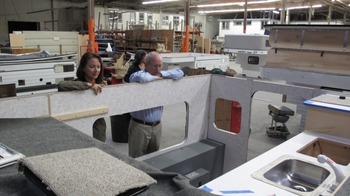 Tom and Roseann looking at an interior under construction.A lot of those improvement can even be applied to older Four Wheel Campers. In a corner of the factory was a cluster of customer-owned campers in various stages of repair and renewal. One vintage model at least 20 years old was receiving a new one-piece roof; others were having skins, water tanks, upholstery, or appliances replaced and updated. It was a reminder that a Four Wheel Camper is a genuine investment—as if prices on the used market weren’t reminder enough. We sold ours (to pay off our land) for 85 percent of what we paid for it new, despite all the use and mileage. Ack. I just reminded myself that we sold it. Take my advice: If you buy one, keep it. Who needs land if you have a home on wheels? 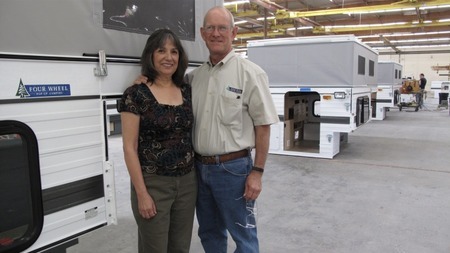 Tom and Celeste Hanagan, the power duo behind the quality and success of Four Wheel Campers. Older PostDo I really need a winch?